Non-Stop: A Turbulent History of Northwest Airlines captures the broad context and the intriguing details as it weaves together the accounts of individuals who gave the airline its unique character. The story it tells, touching on everything from airline food and advertising to smoking regulations and labor relations, encapsulates the profound changes to business, travel, and culture that marked the twentieth century. Jack El-Hai faithfully propels us through the history of a company we all took for granted. From rickety planes delivering mail to one of the largest and most respected airlines in the world, El-Hai lays it out through the highs and lows. At the beginning, heroic pilots and primitive gear, all the way to D.B. Cooper and the Underwear Bomber, the intriguing leadership and crafty politicians, to the final day when the lights went out at Northwest Airlines—all here presented in masterful style. From its earliest flights in 1926, carrying mail and occasionally a solo passenger to Chicago, to its acquisition by Delta in 2010, Northwest Airlines soared to the heights of technological achievement and business innovation—and sunk to the depths of employee discord, passenger dissatisfaction, and financial bankruptcy. Its story, rich in singular successes and failures, also has the sweep of the history of American business in the twentieth century. Non-Stop: A Turbulent History of Northwest Airlines captures both the broad context and the intriguing details as it weaves together the accounts of individuals who gave the airline its unique character: from founder Lewis Brittin and pioneering female executive “Rosie” Stein to the CEOs who saw the company through its glory days and its final tumultuous decade. Non-Stop hits the airline’s high points (such as its contributions during World War II and the Korean War) and the low—D. B. Cooper’s parachute getaway from a Northwest airliner in 1971 and a terrorist’s disruption of the airline’s last year. Touching on everything from airline food and advertising to smoking regulations and labor relations, the story of Northwest Airlines encapsulates the profound changes to business, travel, and culture that marked the twentieth century. Jack El-Hai’s books include Lost Minnesota: Stories of Vanished Places (Minnesota, 2000) and The Lobotomist: A Maverick Medical Genius and His Tragic Quest to Rid the World of Mental Illness. He has written about business and history for the Atlantic, Scientific American Mind, History Channel Magazine, American Heritage, and Utne Reader. [El-Hai’s] book is a concise record of aviation’s race to zoom further, faster, and ever more fashionably through the 20th century. 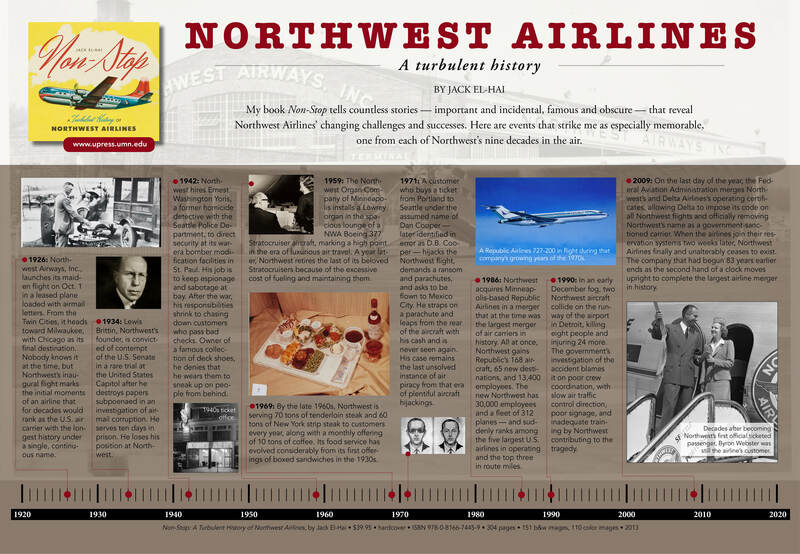 El-Hai’s narrative captures the pivotal business and political moves that allowed Northwest to grow, while also spotlighting the characters and trends of the airline’s history. Non-Stop is not just a history of a particular airline, it is an examination of the whole airline industry. It’s a must for aviation buffs everywhere. Jack El-Hai’s new book, Non-Stop: A Turbulent History of Northwest Airlines, is a bright chronicle of one of the nation’s legacy airlines. Full of mid-century cool, this book soars along on a powerful slipstream of nostalgia. Non-Stop does an outstanding job of balancing the factual history of Northwest’s growth with the human aspects of the airline. [It] is a well-researched, fun-to-read book that both ex-NWAers and people without ties to the airline will want to add to their libraries. It’s chock full of great photographs from the good old days when intrepid pilots like “Speed” Holman flew Ford Trimotors with the mail, with cargo, and with well-heeled passengers who didn’t mind donning oxygen masks when they flew above the line. This book provides a useful retrospective on a unique air carrier that flew for over 80 years and left its mark on its Minnesota headquarters. A definitive account of a great American enterprise that called Minnesota home. Infographic timeline of 9 unforgettable moments in NWA history. Interview with Jack El-Hai, author of NON-STOP. In NON-STOP, Jack El-Hai illuminates the characters who transformed Northwest into the huge airline that Minnesotans learned to love and hate. Jack El-Hai is author of the book about the turbulent history of Northwest Airlines. "A must for aviation buffs everywhere." The Chicago Tribune on NON-STOP. The Star Tribune's James Lileks interviews Jack El-Hai, author of Non-Stop.